About Microsoft SharePoint 2013 : What Is a Workflow? Document libraries and lists in SharePoint have an option to track versions. This option stores old versions of files or items each time a change is made. For example, if a user uploads a document, and then another user edits the document and saves it, SharePoint saves the original document as a version of the file. Later, users can look at the version history of the file and choose to open a specific version or restore it (that is, make that version the current one). SharePoint supports two types of versioning. In the first type, each change is regarded as a major change, and the version numbers go from 1 (the first time a document was uploaded) to 2 (after the first change) and then 3 and 4 and so on as shown in Figure 1. In the second type, each change is regarded as a minor change, unless the user specifies that it is a major one. The version numbers go from 0.1 (the first time a document was uploaded) to 0.2 (the first change) and so on, until a user selects the option to perform a major change, and the version number changes to 1.0, and subsequent changes raise it to 1.1, 1.2, and so on. FIGURE 1 Viewing the lists of versions for a document. Check-in and check-out are common terms in many document management systems, including SharePoint. Their purpose is to prevent conflicts in an environment where multiple people might want to edit the same piece of content (in SharePoint, list items or files) at the same time. The term check-in describes the process of adding a new or modified item or file to a document library or a list to replace the previous version. The term check-out describes the process of locking a version of a document or list item in a list or library. By checking out an item or a file, a user can prevent others from editing that content. By checking in the item, the user can allow others to edit the content, without needing to worry about overriding changes that others have made. Usually when an item or a file is checked out to a user, that user can work on that item or file, and other users cannot. Other users have to wait for the user to check the item or file back in (that is, perform a check-in) before they can edit the item or file. While the item or file is checked out, other users usually can see only the last version that was checked in; they can’t see the changes that the current user has made on the file while it’s been checked out. Pages in SharePoint can be in document libraries—and often are. This means that pages can be checked out and in, allowing page editors to change a page (for example, add or remove a web part), but the users cannot see the changes until that editor is happy with the changes and checks the page in. SharePoint does not require a check-in and check-out on all lists and libraries. This is a setting that the list or library manager can set. In SharePoint, a workflow is a series of steps—some automatic, some manual—that need to be performed as part of a business process for a document or a list item. For example, the most common workflows for documents are review and approval. Some important documents (for example, contracts) need to go through several steps of approval from different people before they can be officially considered final and published. Figure 2 shows an example of starting an approval workflow. FIGURE 2 Starting an approval workflow to publish a page. Another example is pages in a site itself. 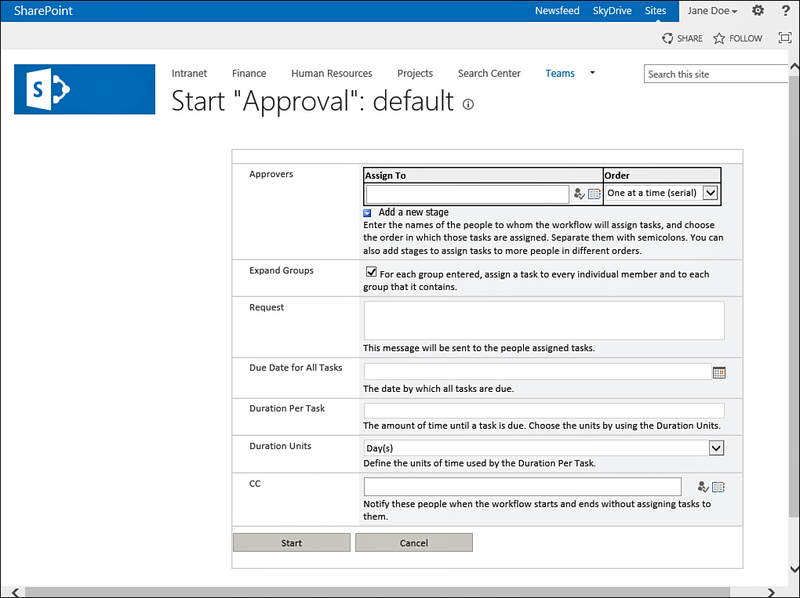 In some SharePoint environments, each change to a page needs to be approved by the site’s manager to make sure the contents of the page comply with the company’s policies. SharePoint allows developers to develop workflows and attach them to documents or list items. End users might be expected to interact with a workflow, either approving documents or items or triggering a workflow to start or stop. In SharePoint 2013 you can make any list or a library into a catalog. This makes the content of the list or library available across the entire system to be displayed. This way, you may have a list of products in one site (a product catalog), and display the products’ information in other sites across the environment using special web parts—without duplicating the content.